Anyhow, the new job involves a 30 mile round trip and will be covering visiting properties all over Essex so round trips of 60 miles approx. on a daily basis. You may have noticed these are all Petrol's as I have never had a diesel, maybe I should consider one? Thoughts and suggestions would be very welcome. As per usual I'm probably looking for the holy grail of motors for lemonade money. What are the reasons for not wanting to use the MX5? Not exactly back breaking distances and highly capable of doing what you want? Or is it a size or adding mileage issue? On that list I’d say the Fiat 500 or the auris. Fiat is small, nippy, reliable, cheap to run, cheap to insure, easy to park, a bit funky and charming. Toyota is reliable, cheap to run, more room should you need it, bulletproof. Downside is it’s dull dull dull. People will mistake you for a minicab driver and it has zero soul or personality. And it’s dull. Panda! And what's wrong with using the MX? Possibly a silly suggestion, but for £6k you could get yourself a really nice Mk1 MX-5, either standard or with some decent upgrades (dampers, brakes, engine). That would make a fantastic daily driver. I've spent about that on my MX including buying it and a new hood yesterday (and adjustable dampers, tyres, wheels, brakes, lightened fly, performance clutch, LSD, Momo wheel and probably more). Superb reliability, fun, a bit special to drive and so on. Stick with using the MX5, only 60 miles a day and if you're going lots of different daily routes you can have some fun on the back lanes etc. Why don't you want to use the MX5? As you say you want to be comfortable and all the cars you list are small and will be relatively cramped. For doing a regular amount of driving I would recommend you get a car with a diesel engine as that will give you very good MPG, low road fund license and enjoyable driving characteristics with a 100+ bhp engine. No need to go bigger than a 1.6 engine and the RFL should be £30 or less a year and you will get a genuine 50+ mpg. Have a look at VW Golf, Skoda Octavia or Yeti or some of the French equivalents. What about a Nissan Leaf. It should do the 60 miles quite easily (even in winter) and cost peanuts in electricity. I do similar mileage and use about £5 per week in electric. Add in zero road tax, minimal servicing costs, no ULEZ charge should you need to go into London and the job’s a good un! The only downside is it’s looks, it can be fun to drive though because all the weight is very low down and the instant torque is addictive. I’d add a Mini Cooper to your list, your budget should stretch to a 2010/11 model. It would certainly tick the fun box and they’re quite practical too (my wife runs one). Not sure about an auto box though. I love the irony, the one thing the current BMW 0.5 is not is mini. I do a similar commute, 29miles each way & use a NC Mx5. I went through a similar process when I started commuting by car rather than by train, and bought a Lexus IS250. Fabulous car, but dull as ditchwater to drive, so I got a Toyota GT86 instead. (If I didn't already have a couple of convertibles, I'd probably have gone for an MX-5). Life's too short to drive a car that's no fun. Mazda 2- comfortable, economical, reliable, and if you get the more powerful version, nippy. Thanks guys, please keep the ideas coming. Reason not to use the MX5 is that I need something capable of lugging some kit and telescopic ladder around and the boot in the ND MX5 is just about big enough for my gym bag and lunch box! I like the idea of a Mini Cooper, a great shout. Like the idea of a Panda/500 Twin Air too. Auris as said is bomb proof but dull, I've driven my Dad's one, but for comfort, ease of driving, economy and reliability its the head over heart choice; although I'm erring more towards the fun cars. I've had 5 Mini's and the wife's current daily is a current generation Cooper S Works 210. Which is mega, but she'll not relinquish it for the MX5 and I really do want an Automatic. VW Golf I reckon but it's all very dull. What's wrong with rear wheel drive as well? Already have the MX5 for RWD fun, but it's dire in the winter as was my BMW, I'd rather something with skinnier tyres and FWD as a year round car, likely on All Season Tyres. Cross climates on a bm or Merc should see thee fine through the poor weather - no? 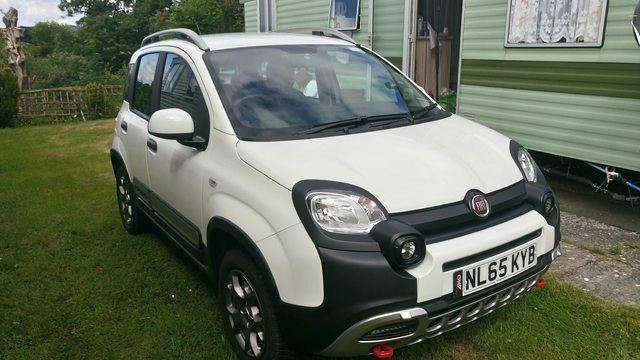 You may just find an Abarth 500 in budget which in my experience are pretty reliable and fun and just as economical as the twin air you’ve listed? I've got the VW High Up! and it's a hoot ! ... I'm six foot tall and bought the 3dr version which has a nice big door and tons of room in the driving and front passenger positions. It's nippy, turns on a sixpence, easy to park and every now and then I put a few teaspoons of fuel in to keep it happy. I find it ideal for low mileage runs and I'm even happy to take it on the Motorway on longer runs as it's so comfortable and pacey enough. It has air conditioning, heated seats, (great in winter) Maps and More, assisted hill start and all that jazz and is great fun to drive. The rear is easily convertible into just about any form of luggage space you want so no problems there either. But it still won’t solve me getting telescopic ladders and surveying equipment in the car. The Fiat Twin Air is a great engine: torquey and bags of character. I'd avoid the dualogic gearbox though - like most automated manuals it's dimwitted, slow and changes gear like a learner. Hard to see past a decent Fiesta, cracking car and great fun to drive. Failing that the VW Up! would also get a vote, but it has an awful automated manual gearbox (not the same as DSG) So, if they appeal make sure you try one and see what you think. Or how about a Suzuki Swift, reliable and very cheap to run. Pretty good fun too for a small run about. You could also try a Skoda Fabia 1.2 (105 BHP) or the Seat Ibiza version, both are basically a version of the VW Polo. ^^ this. I spent some time in Helsinki with work over the winter and could not believe the difference proper tyres make - there was compacted snow on the roads and the cars drive like there's nothing on the road. That said, I wouldn't use a hybrid for a 30 mile commute. If it were me, I'd have a Civic Auto. From your list, I'd definitely go with the Fiesta, they are reliable and really cheap to maintain, and for your budget, probably the vest you'll get. Regarding the others, I'd steer clear of the Fiats, the engine in both is lacking oomph, it's lacking a lot more, but if you're driving as part of your job, I think you;'d get frustrated waiting for it to get going all the time, eg accelerating up hills or overtaking. The Seat would probably be my second choice, those engines are fantastic, and you get similar build quality as you do in VW, but with slightly lower quality parts. You could also consider the equivalent Skoda, you'll get a slightly newer or higher spec car, but the important bits will be the same as the Seat or VW. The big diesel question. Personally I really dislike it, it's dirty and engines are usually noisier, however, for a long time it's been a more efficient fuel to run a car with, but that's changing. For new cars, the Diesel engine advantage is only about 20% now, sometimes less, but diesel is quite a lot more expensive than petrol, around 10% more, so when you take into account the higher cost of a diesel car, the cost benefit is negligible. And that's before you add more expensive maintenance and environmental issues. But yet again I cannot fit telescopic ladders and surveying equipment in my NX5, so still no help. Tyres do not make the car larger. If you’re only going to be doing a 60 mile trip occasionally, then any small car should be fine. However, if you’re going to do this sort of trip several times a week, then I would look at something Golf sized. It will make the journey more relaxing. I did an 80 mile round trip every day for 15 years and most of it was A roads. I had mostly BMW 3 series’s and I got out of the car feeling fairly fresh. I currently have a Mini for a 6 mile round trip everyday and wouldn’t want to be doing my old trip in it. I appreciate your budget but if doing regular longer trips, think about how long you’ll be in the car. On that list the Up! Ah the memories...I used to commute 60 miles a day in a MX5 mk1 for three years. Of course it was on the freeways of California, but it did include 25 miles of twisting mountain roads on the notorious Highway 17 through the Santa Cruz mountains. Sorry. No advice on what to buy though. Last edited by MikeP; 17th April 2019 at 23:33. This but the 1.8S, reasonably quick, reliable, great engines. Howsabout a prev gen Kia Picanto ? 1.25 engine and the auto option is a good old school reliable torque converter gearbox...nippy and great fun to drive, skinny tyres will be good in the snow and you'll have some warranty remaining...Mk8 Civic is also a good shout (I've got a mk 9 with the 1.8, great engine)..very practical and economical but I'm not sure about the auto option, unsure if they used all that semi automated I shift nonsense...anyway, good luck ! OP: What about a Panda 100HP? If you can find a good one. If you have much stop start in towns during your work drive then I'd avoid diesel - if it's mainly fast a and b roads or motorway then a diesel is a possibility. If your journeys are more stop start / town then petrol, hybrid or electric - if you're never going more than 60-100 miles then a Leaf or Zoe is a no brainer it'll save you hundreds a month. Personally my main criteria for a business vehicle would be 1) reliability 2) cost per mile 3) comfort 4) everything else. Fun would be very low on the list especially if you have a fun 2nd car already. To this end I'd be looking at an electric if feasible and then something from Toyota or KIA / Hyundai. Hard top and a roof rack? What about a Panda 100HP? If you can find a good one. The OP wants an auto and the 100HP was 6 speed manual only. Disregarding that, I ran one for 5 years and really, I don't know why I put up with it for that long. They literally have no suspension whatsoever - I've now got an R56 Mini Cooper S with runflats (generally considered to be a hard riding car) - and trust me, it's like a magic carpet in comparison. 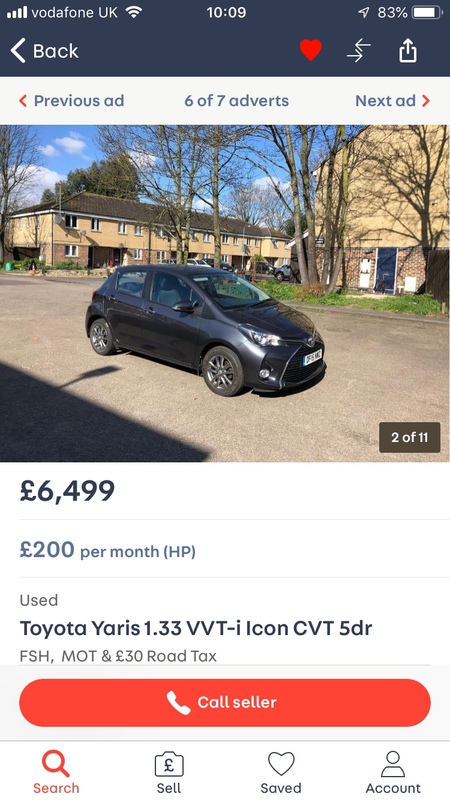 After reading lots of reviews I think I’ve settled on a low mileage 2015 Toyota Yaris 1.33 CVT. Modern, hopefully super reliable, economical, practical, cheap tax, CVT gearbox (I’m actually a fan of CVT’s), nippyish. Ticks all my boxes. £500 over budget but I reckon it’s a price worth paying. Should be a good choice - a guy I know bought one recently for his daughter and he rates it highly. Considering he has all sorts of V8 nonsense at his disposal that's praise indeed. Had an Abarth 595 and driving position was awful so I’d say no to the Fiat 500. Currently in an Up GTI and it’s quite possibly the most fun car I’ve driven for the roads I use regularly. On that basis, and having spoken to quite a few people who own an Up, I’d go for the VW all day long.